Just in time for World Cup, I have finished Unseen Academicals, the Discworld book that takes up soccer — football, as it is known in some places, or foot-the-ball, as it is generally called in Ankh-Morpork. I had not been looking forward to this particular book on my trek through all of the main Discworld novels. It focuses on the wizards of the Unseen University, who are my least favorite among the groups of characters who appear in multiple Discworld books. I was tired of Rincewind by his second appearance as the protagonist of a wizards’ novel, and while the others are more enjoyable to read about than he is, they still don’t hold my interest very well. 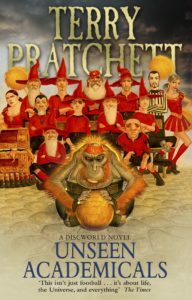 Second, the later novels that don’t feature Tiffany Aching are starting to seem more programmatic, with Pratchett’s interest in exploring a technological development or aspect of society driving the story, rather than telling a good story that happens to look at some subject in particular. Third, Unseen Academicals is the longest Discworld novel, clocking in at roughly 540 pages. The page count has been creeping up through the recent books, without commensurate gain. I like Pratchett’s stories better when they are brisker and tighter than when every development in the tale is lovingly indulged by author and editor. The book also shares Thud‘s problem, that of an important and universally known aspect of culture that the author has somehow failed to mention in 36 preceding books. Pratchett nods in this direction early on, writing that there is so much violence in the game that the participants keep it clandestine, and so many participants that the Watch finds it expedient to steer clear of games as they happen. I wasn’t convinced. For example, if the game is as important to the social lives of Ankh-Morpork’s right poorer inhabitants as Unseen Academicals claims, then young Sam Vimes would have been a part, and he would surely have said something about it in all the novels where the conditions of his growing up are mentioned. Pratchett does better with his handling of Rincewind; namely, he sends him off-stage right away. The main trunk of the plot grows from two developments. The budget of the Unseen University — and thus, crucially, the institution’s ability to support the wizards’ luxurious eating habits — depends on a bequest, one of whose provisions is that the University must field a football team regularly, and the time defined by “regularly” is about to expire. The other is that Vetinari has decided to put a damper on the massive mob violence that accompanies foot-the-ball matches. Here, readers can see echoes of the violence that plagued British soccer in the 1980s and 1990s, along with efforts by authorities to curb it. Both reasons seemed contrived to me, and contributed to my overall sense of the book as programmatic, rather than a story arising naturally from the characters and setting. In addition to the senior wizards who have been around for several books, Unseen Academicals stars several people from the serving class that keeps the university running. Glenda is in charge of the night kitchen, makes formidable pies, and embodies the bedrock decency of most of Pratchett’s protagonists. She also comes in for criticism because of some of the things that she assumes that are part of her decency. That is a level of reflection I have not often seen in Pratchett’s work; on the other hand, it’s Vetinari doing the criticizing, and he hardly has any room to talk in the matter of manipulating people. As he would freely admit. Juliet works in the kitchen with Glenda. Juliet is not very bright, but she is stunningly beautiful; some of her choices lead to a subplot on fashion and celebrity. Trevor Likely is part of the cadre that ensures the university’s candles are all artfully dribbled. He is also the son of a famous foot-the-ball player and has no small amount of talent himself but has sworn to his dear mum that he will stay away from the violence. Mr Nutt is a dribbler like Trev, and turns out to have an even more unusual personal history. All of these characters show more of the university than the haphazard wizards that Pratchett had previously depicted. A school of magic involves a vast supporting cast, and they are real people with their own stories. Interestingly, the students are entirely absent from the picture. That, too, is a comment on how universities are seen and run. Pratchett waxes droll on other topics, too. That’s an interesting point for reflection. Who are the “they” that Glenda has in mind? What’s it like to look fondly on something you know to be horrible? Pratchett leaves questions like that unexamined in Unseen Academicals, whether by accident or design, I can’t quite say. At the end, I was mostly relieved to be finished with the book. It could have been much worse; there could have been a lot more Rincewind, for example. On the other hand, it didn’t do much to raise my opinion of the books about the wizards, or my view that the later Discworld books would be better if there were less of each one. A Tiffany Aching story is next, so I am looking forward to a tighter and less programmatic story.